*to generate a greater altruistic purpose to strive towards – together! The list literally goes on. Delegates can expect 3 hours of inspired change philosophy, unique perspective from four thought leaders, mixed with fresh and innovative concepts ready for your organisation to then explore and adopt with confidence and passion. This event is FREE to attend as the goal is to share the vision to create a more sustainable workplace culture, inspire a success mentality within business and make a tangible difference through our own efforts both in and out of the business community. eMAGINE was established in 2015 with the core purpose to inspire positive change initiatives that help assist community organisations, corporate growth, and humanitarian developments. We have brought together a collection of influential entrepreneurs and innovators who have established themselves in their chosen field of expertise. These individuals have a core purpose to create roadmaps and strategies for those looking to make a prominent and constructive change in their circle of influence. 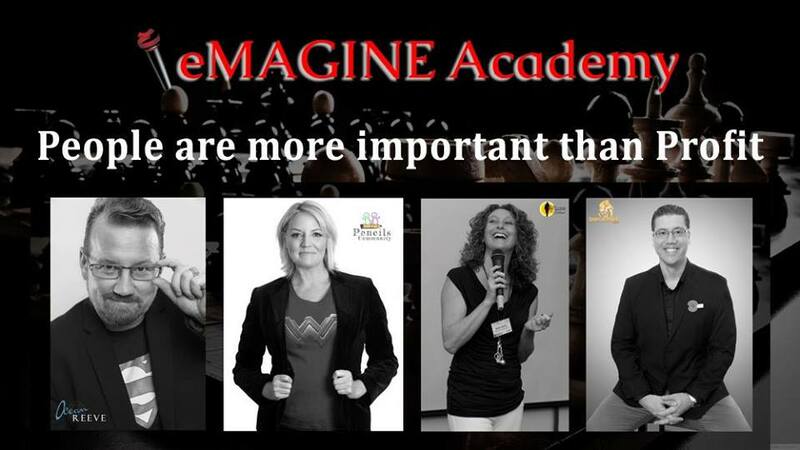 The eMAGINE Academy offers top-level speakers, courses and training suitable for all demographics including individuals, community groups, schools and higher learning institutes, SME’s, top-level corporates and humanitarian organisations. We want your experience with the eMAGINE Academy to be rewarding, positive and inspired! Our eMAGINE speakers are highly qualified professionals with extensive experience in their chosen field and familiar in working with people of all ages and backgrounds. We understand that every individual develops at a different pace, and our speakers content and course learning material are structured accordingly. We also take into consideration each individual’s motivation and need for growth and development given this will influence the subjects objectives.